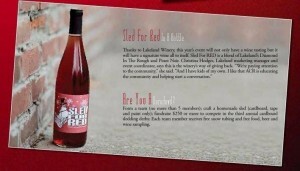 Lakeland Winery is donating $2 for every purchase of our Diamond in the Rough wine to the Sled for Red derby on Feb. 9 in Fayetteville, New York. Teams of five craft their own sleds made only of cardboard, tape and paint to compete and raise money for AIDS Community Resources. Diamond in the Rough is a deliciousÂ mix of Diamond and Pinor Noir grapes.